"Yes, Dr. Hortfreud, I did." "What's going on that you need me now, Carol?" "Well, Dr. Hortfreud, I think I've crossed a line." "Crossed a line? What do you mean by that, Carol?" "I bought pants for gardening." "Oh, is that all? You've already bought at least four pairs of shoes just for gardening and another pair for mowing. And look at all the crocuses you planted. They sure are pretty. And I saw that new hand hoe in the garage, too. How many hoes do you have now? I'd say you are well beyond any imaginary line you've dreamed up." "They were expensive pants, Dr. H. I don't think even when I worked I ever spent this much money on a pair of pants." "Go on, tell me about them." "They are made of a lightweight fabric that doesn't snag easily and isn't too hot. And they have pockets at the knees to add knee pads." "And you bought some knee pads, too?" "Have you worn them, Carol." 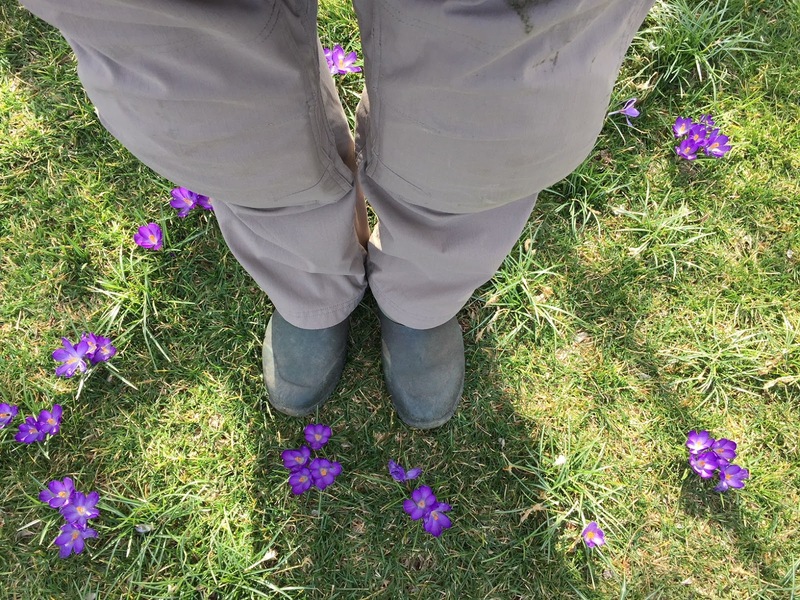 "Oh, look at you, standing amongst the crocuses in the lawn, wearing the shoes you normally mow in." "Dr. Hortfreud, this is serious!" "No, it isn't that serious. But those are some seriously good gardening pants. And I see you already got some dirt on them." "Yes. First day out. I love them. I can kneel with abandon in the garden now with the knee pads. And there are lots of nice pockets, too. I think I want another pair." "Go ahead, Carol. Get another pair. Move that imaginary line just a little further out. Or even better, just forget there is a line. Repeat after me. There is no line. Buy more pants. Buy more crocuses. Get another hoe!" "Thanks, Dr. Hortfreud. I knew you'd understand!" I like that they don't get too hot. I'm really tempted. Phew. I was worried you were about to fire Robert Muller. You have to have two pair so while one pair is being washed you have a clean pair to wear. Nice. Well, no question you've given Duluth Trading a boost in the sale of gardening pants today! Good job, they offer great stuff. The crocus lawn is sure looking sweet!! Oh, I forgot. I didn't think the previous owners planted anything but foundation plants. I found some crocus, yesterday! Woohoo! My neighbor had suggested that at my age, 75, I should carry my phone on me. The vest has plenty of secure pockets. Wonderful. I dream of the day the only wardrobe essentials I need are for gardening. I am going to have to check these out--love them! No need to feel guilty, Carol--if you're like me, your clothing budget went way down when you retired. Better to spend the money on something you'll actually use, like garden pants, than another fancy blouse that will hang in the closet unused.